A regional daily printed its second special edition in the space of a week after a house fire claimed the lives of five children early today. 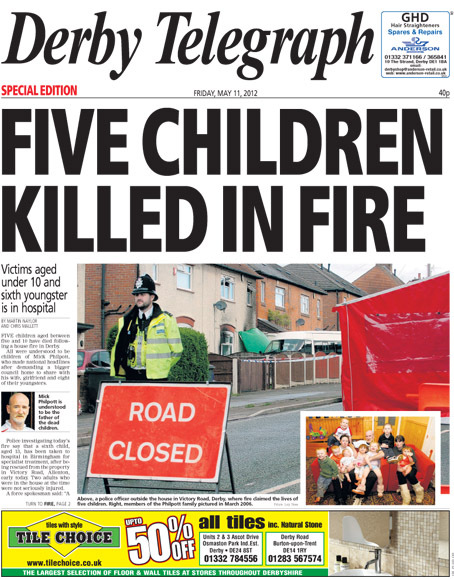 Seven days after publishing an on-the-day edition to report a change in control at the city council, the Derby Telegraph pulled out the stops again after this morning’s tragic blaze in the city’s suburb of Allenton. The Northcliffe-owned title printed 10,000 copies of the late edition, which included the revelation that Mick Philpott was the father of the five children who died. Father-of-18 Mr Philpott achieved national notoriety in 2006 after the Telegraph revealed he was demanding a bigger council home for himself, his wife, his mistress and eight of their children. The Telegraph is normally printed overnight in Birmingham but today’s special edition went to press at 11am in Stoke. It included live pictures from the scene as well as an interview with a friend of Mr Philpott’s who told how the frantic dad had been seen breaking windows downstairs in the house as he battled to get inside to reach his family. The Telegraph team had already been working until late on Thursday night on two big breaking stories for its morning edition – the alleged murder of a baby in the suburb of Chaddesden and the collapse of a disused pub in Sunnyhill. It followed last Friday’s coverage of political power changing hands in Derby at the local elections as Labour ousted the Tory-Lib Dem coaliton. Editor Steve Hall said: “This has been a terrific team effort. The guys on the press and in distribution pulled out all the stops to ensure that we could get copies back into market. Latest reports about the fire and its aftermath can be found on the Telegraph’s website. I remember when this used to happen, erm, every single day. Newspaper prints a paper, am I missing something here?